As I am sure most of you know or at least have heard of Edmodo. 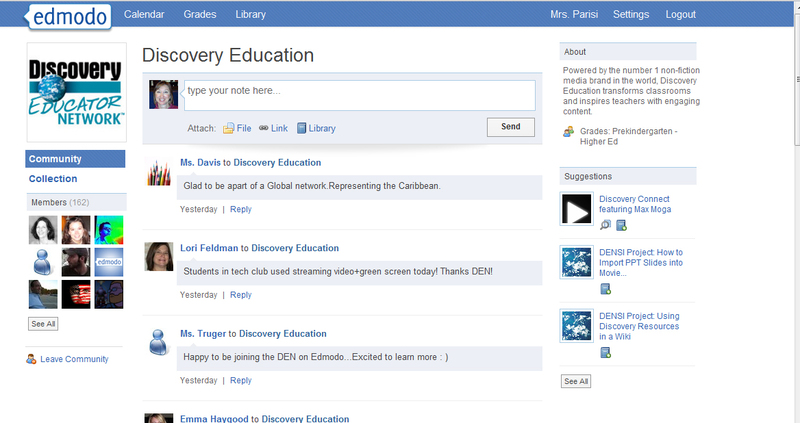 Edmodo is a social media site with a format similar to Facebook. It is geared towards students and educators, and I absolutely love it! I have a friend that shared the site with me this past fall. I implemented it very soon afterwards, and my students seem to love it. Edmodo is a wonderful way to upload and post hand outs and resources for students. If a student is absent, they are able to look for the date they were absent, and see what was done in class that day. I also love that students are unable to friend each other or send each other messages. I also am able to monitor what gets posted onto each class “wall.” The apps aren’t my favorite that are on there, but they do have things where students can review. I can also create quizzes that will get automatically grades if labeled multiple choice. It does make things a bit easier. I also enjoy that I can set things up by class period, as well as customize calendars per class. It’s definitely a resource I would recommend for 5th grade and up. Most middle schoolers have computers at home, smart phones, and tablets with apps they are able to access the software. This entry was posted in Class, Uncategorized and tagged 6th grade, app, classroom, edmodo, education, english, integrating technology, language arts, middle school, school, teacher, teaching, tech, tech-savy, technology, technology in the classroom. Bookmark the permalink. ← The end of another year….